Sometimes it’s just easier to keep the guest list where it’s at and not even attempt to hurt any feelings or cause any riffs by cutting out certain people from your wedding. And maybe you’ve always dreamed of a big wedding with all of your family, friends, and friends of family attending to witness your spectacular day. And we don’t blame you; your wedding is your day to be surrounded by the people you love most so don’t leave anybody out and make it a grandiose celebration! Even so, a certain personal touch can be lost in a big wedding, and here are our tips for making your large event still feel intimate. The images on Pinterest with the long, royal-like dinner tables look amazing, but it can really cut people off from being able to socialize with each other. Especially if someone’s best friend is 40 people down the row. A great way to make a large guest list feel not-so-large is to use small tables that seat only 8-10 people. This way, you can control who sits by who and can encourage conversation much better. There’s just something about soft, romantic lighting that can bring people together and create a more intimate atmosphere. 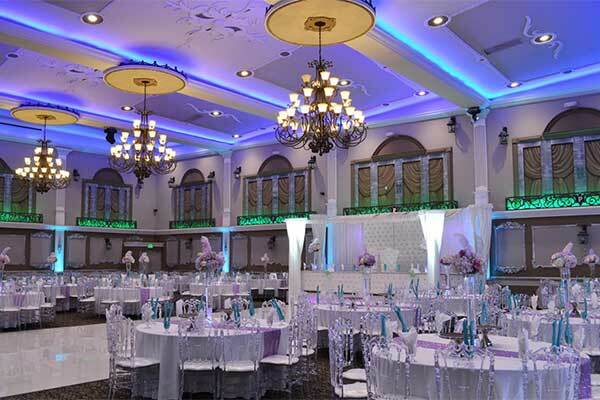 Work with the lighting professionals at your indoor venue and ask for lights in pinks and purples. And you can never go wrong with adding plenty of candles for warmth and ambiance. Plus, your venue will look totally romantic. If your reception is in a large, gorgeous banquet hall, work with your wedding planner to come up with separate lounging areas with comfy couches and chairs to create little hideaways for guests to relax. Lounging areas also look very glamorous and you can have fun with renting elaborate, vintage-inspired furniture for the lounging stations for added décor, uniqueness, and for a swanky vibe. A good rule of thumb is to increase the amount of staff with the addition of more guests to ensure everyone is taken care of properly. No one likes to feel like just another face in a sea of people, and it is very frustrating for guests if they have to track down a staff member just to get a refill on water. While your wedding is all about you, you need to cater to your guests and play a gracious and welcoming host. So make sure everyone has a great time by taking on additional waiters and waitresses and doubling up on bartenders. People have a hard time finding something they appreciate more than a personalized, handwritten note thanking them for their presence and showing your love and gratitude. Even if you have 500 guests at your wedding, each and every person there will feel thought of if you include a short, personal note on each place setting with the person’s or couple’s name. If guests walk into your reception and it looks exactly like every other venue they’ve seen on Pinterest, there will be nothing personal or intimate about it. They won’t feel like they’re at your wedding, they’ll feel like they’re just at a wedding. So avoid going overboard with trending Pinterest décor and little details and make it unique to you and your style. This way, your guests will see you in every detail in your wedding, and it’ll feel much more memorable. If you have tons of family coming in for your wedding and friends heading from near and far, consider dropping the idea that your wedding celebration needs to be packed into one day, and make it a weekend event. You’ll get the chance to speak with each person you know you need to talk to (or else your mom may kill you), knowing that when the wedding day comes, you’ll be busy, in a whirlwind of excitement, and more focused on enjoying every moment than spending the entire night talking to people. It’s your wedding and you want to dance all night! Host a few social events at a home or restaurant and invite guests to come and hang out in a relaxed, much more intimate setting. Who says you can’t have your cake and eat it too? On your wedding day, you will definitely be eating some cake, but you can also achieve an intimate wedding that feels very you without having to cut down on the guest list.